One of the coolest, and most unique characters in the game was only available for a limited-time during the Treehouse of Horror XXIII event. Kang, the alien from the planet Rigel IV, could only be obtained by purchasing the Ray Gun for 100 donuts. After completing “The Black Hole Pt. 4″, Kang’s UFO would fly over your town somewhat menacingly. Purchasing this item would allow players to shoot down the UFO, causing Kang to crash land into the Ray Gun. After this sequence the Ray Gun becomes the Crashed UFO and Kang is introduced as a permanent resident in Springfield. Don’t worry about your Ray Gun though, Professor Frink puts a brand new one in your inventory, just in case of another alien attack. What is your favorite Treehouse of Horror story? The Treehouse of Horror XXIV, is scheduled to air on October 6, 2013. It is incredibly likely that the game will receive an update around this time to celebrate Halloween, as well as to have some tie-in content with the episode. Last year iOS players were treated to what was, in my humble opinion, one of the best holiday (and social) events of the game. Hopefully the developers can recreate that magic this year as well. Taking into account the vast history of the Treehouse of Horror, which story do you remember the most fondly? Wouldn’t it be great if this Halloween update drew from some of the older specials as well? Given the high price of premium stuff lately, I would very much appreciate it if the game decided to rain donuts. 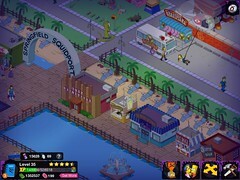 When the Treehouse of Horror XXIII update to the game launched, it brought more than just the next level to the game, it started a holiday event that gave players a reason to play everyday. By collecting candy pieces you could purchase Halloween themed content, only available during the duration of this event. Along with this update there were a few limited-time items that could only be acquired by purchasing them with donuts. One of them was the “Cauldron” an item that unlocked the only alternate costume for Marge to date. The added bonus of this costume, which cost 90 donuts, was that every task rewarded you with a candy piece. At the time that added more value to this extra, helping to justify its cost. As a standalone costume, its more of a novelty. It does have one interesting feature, which allows Marge the Witch to speed up a crop on Cletus’s Farm. It’s a four-hour task, that shaves four-hours off of the time it takes to build a crop. Even if you didn’t purchase Kamp Bart, you are still given a quest the leads-in to it. Should you decide to purchase it, you will get the only costume available for Bart so far. The asking price of 200 donuts is incredibly steep, and judging by a your responses this piece of content wasn’t a particularly attractive purchase. Timing wise, it really clashed with the “Rod and Todd” and “Bread and Putter” story lines that were also released at this time. By releasing all of these quests focusing on the children of Springfield at once, it made things a bit disjointed. Even as a stand-alone quest, Kamp Bart wasn’t particularly interesting. Perhaps you’ll have a different take after reading the dialogue presented in this walkthrough. For some, spending money on this game may be difficult to justify, at least from a game play perspective. The enjoyment of the game comes in small doses. If you had unlimited funds and unlimited donuts, you could build everything and rush every task. This would leave you with very little motivation to continue playing the game, especially if you weren’t reading the dialogue between the characters. The charm of The Simpsons has always been its strong writing, so if your favorite character is placed behind a pay-wall, you may consider making a small purchase. Decorating your town is only one aspect of the game, but without the characters to populate that town, the whole experience feels rather empty. In that regard it does makes sense to want to purchase as many characters as possible, to make your town feel as diverse and populated as the television show. Unfortunately to do that you’re going to have to spend some money, as some of the best characters are put behind a pay-wall, or worse, are only available for a limited time. Recently the problem with that has been the increased cost of premium content. Take a look at the different options for buying donuts versus the cost of the items you can buy. Say you really wanted to add Sherri & Terri to your town, a premium character that cost 150 donuts. The first three options of 12, 60, or 132 donuts aren’t even enough to get you that one character. You’re going to have to spend at least $19.99 on 300 donuts to get just one piece of premium content. For twenty dollars you could purchase a brand new game on a service like Steam, and still have money left over for lunch. Is it really worth it to spend that much money on something that is only going to add a marginal bit of diversity and enjoyment to a game you’ll likely only be playing for five to ten minutes per day? It may not seem like much, but micro-transactions can put a huge dent in your wallet without you even realizing it. One other thing to consider is that whatever you are buying, it isn’t tangible. You can’t even play the game without an internet connection, or if Origin is down. So if either of those two scenarios happen, how angry are you going to be that you can’t access the content you poured hundreds of dollars into? It isn’t worth it to cheat, because you’ll get bored with the game because there won’t be anything left to do. It’s also not wise to spend so much money on content that doesn’t really add that much to the game. So what is the solution? Honestly donuts should be cheaper. The only reason they aren’t is because people are continuing to buy content at these high prices, making the game a financial success. You should be able to spend a dozen donuts and add a new character to your town. It’s much easier to justify spending two dollars on a character than it is twenty, especially when new content keeps being added to the game every couple of weeks. If you really want to see the quest dialogue, check the walkthroughs. If you want to see the character animations, check YouTube or maybe you’ll get lucky and see them in one of your friends’ towns. Save your money. Play responsibly. Enjoy what you are given for free.